Supplemental material reads: "Gershon. City desk. Illus. Caronia arrives. Two shots of George Whitney, president of J.P. Morgan & Company. could see no 'reason to fear a recession in the immediate future'. He was among cruise passengers on 'All South Pacific Tour' by Cunard Line's 'Green Goddess', the S.S. Caronia which docked at Pier A berth 6, Long Beach for 24 hour stay. Two shots of Dr. Hubert Eaton, Forest Lawn, holding Opal 'Star of Australia' he bought during cruise of Caronia. Star of Australia, reportedly worth $500,000 to $1,000,000, is a black opal. Next largest one on table will be added to Forest Lawn objects d'art for public gaze. One shot of Mr. and Mrs. Abner Wolf, 'they shared $29,000 suite on Around South Pacific Cruise of Cunard Line's Caronia which arrived in Long Beach for 24-hour stay yesterday (Tuesday). 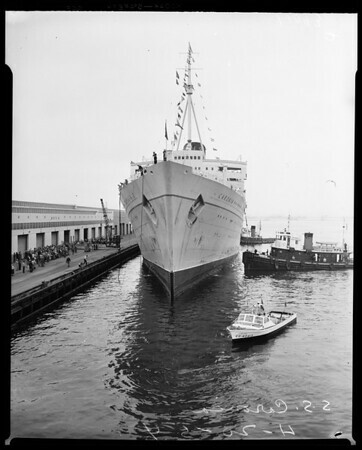 Other shots S.S. Caronia docking at Pier A. Berth 6 Long Beach. Coast Guard harbor patrol craft in foreground".